Proximity marketing has to do with a series of advertiser technologies and strategies that allow real-time detection of the physical location (position) of the consumer or potential customer in order to distribute information of interest through messaging, either of text or multimedia (image, audio, video, etc). Proximity means knowing where your customers and assets are and interacting with them in a meaningful way. Proximity marketing is based on a completely technological platform that is able to detect the proximity of people to a product or specific areas within a radius of meters or kilometers away. There are those who believe that the concept of proximity marketing applies only a few meters (no more than 100 meters) and that all proximity to greater distances is about location-based marketing called geolocation marketing. Regardless of distance, we can say that both concepts rely on proximity technologies. Mobile devices have for the first time outstripped personal computers as the most common devices of Internet access. This is a sign of the strength of the mobile industry, which continues to grow year after year in the market for electronic devices. The marketing industry, knowing these trends and taking advantage of the high use of mobile devices such as smartphones, has been dedicated to developing multiple applications that make use of some electronic components or sensors with this type of mobile device to detect the location or proximity. When we speak of a spot or location we refer to proximity in a particular geographic area; i.e. obtaining the length and latitude of a mobile device through its GPS or, failing that, by means of a triangulation with the nearest mobile telephone antenna. For shorter distances, mobile applications make use of other components of the smartphone to detect proximity such as: Bluetooth, NFC, WIFI, QR (camera), among others. One of the most popular trends of the moment in proximity marketing is Beacon technology. A beacon is a small wireless device or sensor that sends a proximity signal, through low-power Bluetooth, to mobile applications developed to capture important information in real time. The beacons can reach a signal range of 50 meters, and next to its small size makes them the perfect object to be placed strategically in the points that are most interesting for our business. Proximity marketing applications are in charge of interacting optimally with the different sensors that the smartphone can have active and keep connected to a whole platform of marketing services in the cloud. Proximity is a term for a variety of technologies that describe a number of different ways of connecting physical things to the Internet. Welcome to the exciting world of the Internet of Things (or IoT to make an abbreviation). I am a sportsman who is walking through a mall and step within a few meters of a sports store called XYZ, and suddenly I receive a notification on the mobile that says: “Hi Jorge, come to XYZ and enjoy a special offer of sports shoes at 40% discount “. For me, it is a big tempting and almost irreproachable offer. All this happened because I am an athlete. The notice gets my attention and I proceed to enter the store and before deciding to make the purchase of my dream shoes I start to walk the store seeing other items of my interest. Finally, I choose a size 42 blue shoes, I make the purchase and I leave the store happily because it saves me 40% and likewise the store XYZ is happy because not only have they sold some shoes, but also know my preferences in shoes and size) for future offers or promotions. But this still does not end! It turns out that the store had beacons located in several areas and while I was doing the tour I stopped for a while to observe the beach items area. Over the next few weeks I’m going on vacation to Florida, and being there I get another notification from XYZ stores, this time making me an invitation to a weekend event at Ocean Drive Beach where they have some 2x1 deals on clothing Beach. Another offer I cannot pass up. Again I am surprised that when I arrive at the beach event I receive a notification on my phone to download the itinerary of all the activities of the weekend organized by XYZ. Is not fascinating? Now, how did this whole story begin? Like this. The XYZ store started a campaign to encourage users to download their mobile app and register. The app, at the time of registration, requests certain basic information to create the user profile. Users use this service to find their products of interest, promotions, and coupons and even to make online purchases. This interaction allows the store to get to know the preferences of its users and launch campaigns quickly depending on the location of their customers. From the moment the user decides to register on the platform, a constant channel of communication and learning is open between the store and its customers where both are benefited. What technology is it used? Some of the software and hardware technologies commonly involved in proximity marketing solutions are the following. Strong mobile applications that allow safe interaction with the various sensors and electronic components of the device. Such applications must work optimally avoiding high consumption of resources, data, and battery. Proximity sensors such as Beacons or RFID or NFC tags strategically located at points that are most interesting to the business. Cloud services for ingestion and mass storage of events. These services are responsible for collecting and storing, in real time, information on proximity events or geolocation generated by mobile applications. Notification services via email, SMS, push messaging, among others. Business intelligence services to generate analytical statistics from marketing data for decision making and strategies definition. Machine Learning services for automatic learning of proximity data and user preferences to be able to identify complex patterns and predict future behavior. Management solutions and the management of proximity campaigns for advertisers. Companies should create campaigns to promote the use of this type of mobile applications. Even these tools can be viral once they become social and collaborative networks. Businesses should encourage the user to keep Bluetooth or GPS active so they can receive real-time notifications of any kind of advertisement, promotion or offer. At the same time, confidence in technology must be created. Currently, smartphones are incorporated with sensors of very low consumption which greatly favors the implementation of this type of technologies. In the same way, the applications can work even with these sensors turned off and continue generating other types of benefits to the client. Users must authorize their exact location to be known, but it is a habitual procedure to which the client does not usually oppose. However, it is important to reward the user with some incentive for the latter to allow access to a private data, thus reinforcing positively the image of the brand and creating the perception of a beneficial relationship between customer and brand. It is very important to carefully plan the policy of sending notifications in order, not to overload users. All this, because we know that on the internet spam and other types of unsolicited shipments, have proliferated in the network. For all this, robust proximity intelligence and machine learning technologies are the key to success. The security mechanisms of these services should be strengthened, since proximity marketing must guarantee the security of the data transmitted to the cloud. Proximity Marketing in the hands of the Internet of Things (IoT) concept, no doubt, is here to stay and is becoming a technological revolution that will change the way you do marketing; in fact, it is already doing so. We must be prepared for the great technological avalanche that even is already between us and many times without being aware of it, that is the power of the Abstraction of Technology as a way of not visualizing complexities, just to see the benefits. Definitely, knowing a little more about technology and knowing how and when to use it, we can make things easier and at the same time, achieve the growth of our businesses, to be more competitive and to make a difference with our competitors. For so many years that I have developed in the world of technology, I have seen businesses stagnate, or break in the worst case, precisely because of the fear of innovation through technology. Now, I tell you in all sincerity, there is nothing to fear, the solutions are there, I invite you to know a little more about this exciting world of technology. 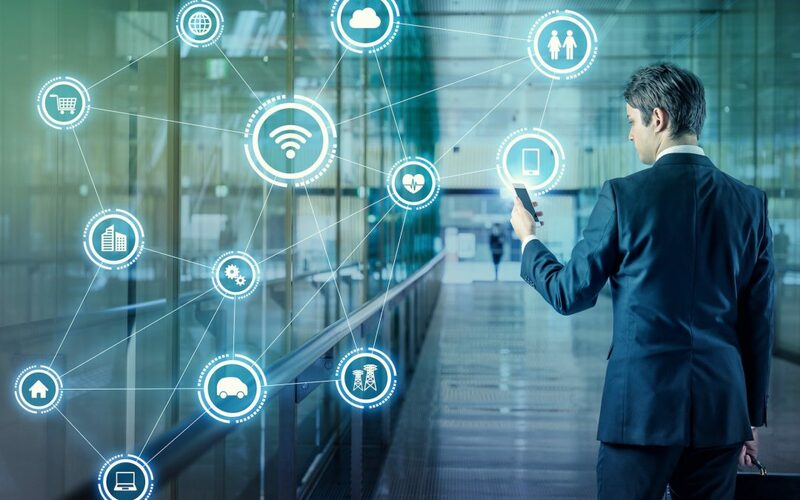 In this article we saw how the IoT intervenes in the world of marketing; however, it is not the only area where things interconnect. For our next Post we will talk in more detail of the IoT and we will make a tour in each one of the technologies mentioned here. Are you ready?.